On March 25, Tropical Cyclone Veronica continued to move in southerly direction along the coast of Western Australia in the Southern Indian Ocean. NASA-NOAA’s Suomi NPP satellite provided a visible image of the storm. NASA-NOAA’s Suomi NPP satellite passed over the Southern Indian Ocean and captured a visible image of Tropical Cyclone Veronica on March 25, as it continued moving along the coast of Western Australia. Credit: NASA Worldview, Earth Observing System Data and Information System (EOSDIS). Suomi NPP passed over Veronica on March 25 and the Visible Infrared Imaging Radiometer Suite (VIIRS) instrument provided a visible image of the storm. The VIIRS image showed what appeared to be a cloud-filled eye just off the coast, surrounded by powerful thunderstorms. The eastern and southern quadrant of Veronica was over land, while the rest of the storm was over the Southern Indian Ocean. 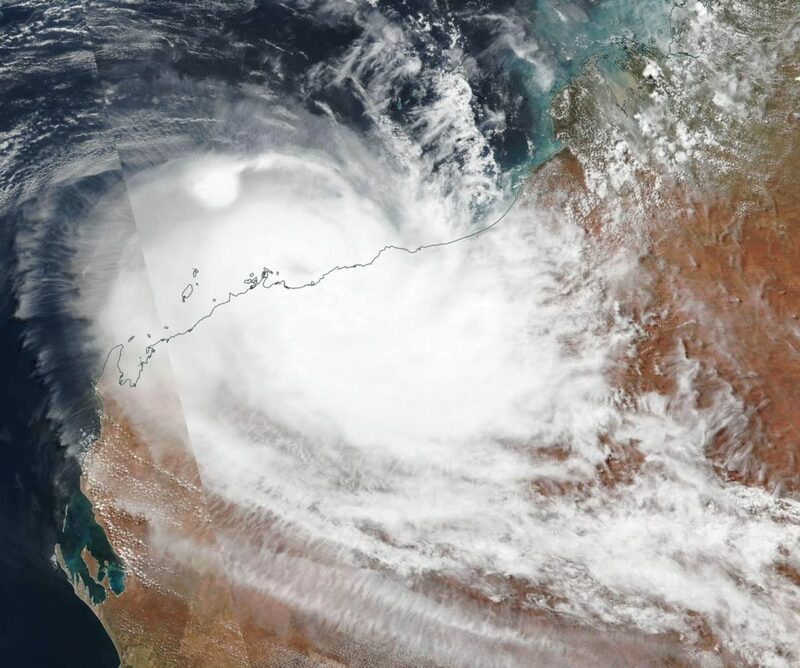 The Australian Bureau of Meteorology or ABM said that Tropical Cyclone Veronica, located near Karratha, was moving slowly west southwest and is likely to weaken below tropical cyclone intensity early Tuesday. Heavy rain over the central Pilbara will ease during Tuesday. The Warning zone for March 25, 2019 extended from Roebourne to Mardie, including Karratha, and adjacent inland areas. At 11 a.m. EDT or 11:00 p.m. Australian Western Standard Time (AWST) the ABM said that Veronica has maximum sustained winds near 75 kph (46 mph). Veronica was located near 20.4 degrees South latitude and 116.7 degrees East longitude. That’s about 30 kilometers (18.6 miles) north of Dampier. The cyclone is a category one system currently located just off the central Pilbara coast, north of Karratha. Veronica is expected to move towards the west southwest and is likely to weaken below tropical cyclone intensity early Tuesday morning.